Commonwealth Cup and D-III dominates this past weekend's recaps, so catch up before we hit a massive weekend in the college season! It was a strong showing for #8 North Carolina Pleiades, who rumbled at Commonwealth Cup to the tune of 7-0. The asterisk on their undefeated record this season comes from an uncounted “loss” to #10 Tufts, a soggy Sunday game at QCTU that was cut short about an hour of the way through. It did not reach halftime, so the game doesn’t count in the rankings. They faced the same Tufts squad in the final of Commonwealth Cup and this time demonstrated their superiority with a 12-10 win. Jenny Wei was dominant both as a thrower and receiver, tallying four assists and five goals. The game was within a goal or two for most of it, including as close as 10-9 after a run from Tufts early in the second half. Both finalists survived close scares from teams from the state of North Carolina in the bracket. UNC’s closest game was against the Triangle Tourists, a youth club team with experience overpowering college squads, in the quarterfinals. They kept it close with Pleiades, losing 12-11. Meanwhile, in semifinals, Tufts came back from a 9-8 deficit to NC State, winning it on double game point, 11-10. NC State was also one of the surprises of the tournament, notching wins over #22 Michigan and #23 UNC Wilmington. Look for them as a newcomer to the Ultiworld Power Rankings this week. For full tournament coverage of Commonwealth, check out our Tournament Recap. The Thursday night before Commonwealth Cup, NC State claimed the first women’s game in the Atlantic Coast Showcase, beating Duke 15-9. Duke’s Amanda Murphy, however, put on a show in a losing effort. You can read more here. Host and no. 3 seed Towson won the aptly named Towsontown Throwdown, taking down George Washington in the final by an impressive 15-6 count. Both the no. 1 and no. 2 seeds, American University and West Virginia, were knocked out in quarterfinals. After finishing 3rd in their pool on Sunday, no. 3 seed Portland State bounced back to win four bracket games, including the final on double game point, at PLU BBQ. Portland State’s 13-12 over Oregon State is particularly impressive knowing it was their 8th game of the weekend. With an impressive +45 on the weekend, no. 2 seed Kansas won Dust Bowl, outscoring John Brown 15-9 in the final. Their toughest test was Denver, who they defeated 11-8 in their semifinal. Ohio claimed both pool play and the bracket at Ben’s Barmitzvah, outplaying Dayton in the final, 10-8. They were, however, upset in pool play by Xavier, 10-9. Bring the Huckus had Sunday rained out — yet more lost ultimate. The two power pools were claimed by no. 1 seed Williams and no. 3 seed, Boston College. There were some key D-III observations here, which can be found in our D-III update below! Big D in Lil D was rained out. May it be the last tournament written about in this fashion this season. Another wet and muddy weekend, another set of ‘what ifs’ with no Sunday bracket playing out for various tournaments. Teams in the D-III women’s division in particular were hit hard by game cancellations at Bring the Huckus, the first time we’ve gotten to see a lot of teams out of the Northeast, Metro East, and Ohio Valley this season. 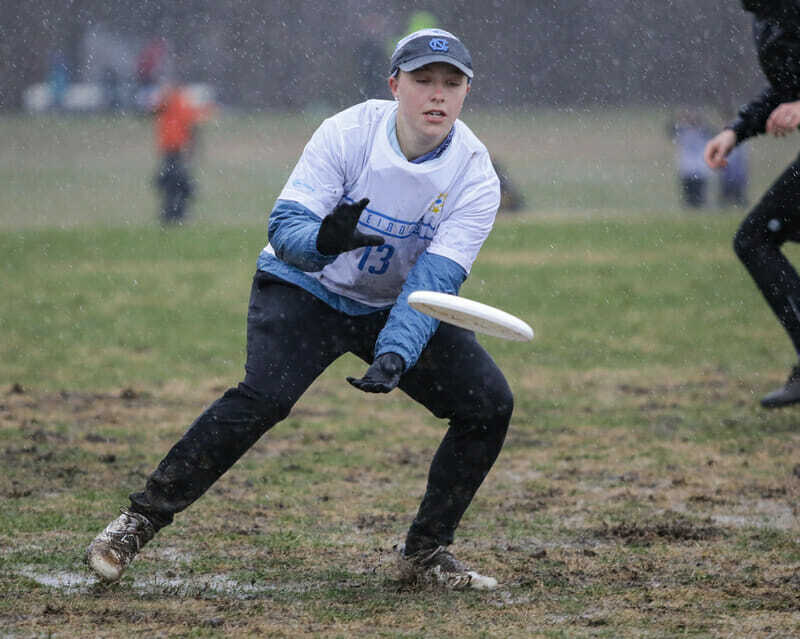 Nevertheless, a lot of ultimate was played across the country, confirming and surprising some of the early season chatter and predictions for these teams. Both D-III teams at Dust Bowl in Tulsa had a nice weekend for different reasons: #14 Carleton Eclipse rebounded from a tough Stanford Open performance with a tidy 3-0 in pool play and no blowout losses on Sunday like we saw at that tournament; they continue with an upward trajectory, developing their on-field chemistry in all kinds of weather. The team Eclipse lost to in quarters? None other than #12 John Brown Savage Skies, with a final score of 12-8. John Brown went on to squeak out a 13-12 win over Arkansas and take second after a second loss to Kansas on the weekend. The ladies from John Brown should certainly be considered for the automatic bid from their region to Nationals after a February performance like this. Over 10 games were played between D-III teams on what ended up being the only day of Bring the Huckus. #1 Williams LaWUFA ended up at the top of pool A with a 4-0 Saturday, scoring a 9-8 win over #8 Skidmore Thoroughbears and beating #10 Wesleyan Vicious Circles and #9 SUNY-Geneseo Escargot by margins of three and 11, respectively. Until shown otherwise, they continue to be a powerhouse of both the New England region and the Division. More surprising: at the bottom of Pool A, Skidmore went 0-4 but with all losses occurring by a margin of two points or fewer. These kinds of numbers are not demonstrative of the team’s skill and playing ability. New England represented itself well in Pool B: #17 Amherst Sparkle Motion and #5 Bowdoin Chaos Theory ended 3-1 and 2-2 against their opponents, respectively, both thrashing #21 Haverford, who lost to their D-III rivals by six or more points. The Ohio Valley’s saving grace of the weekend came from Dickinson Jive Turkeys, who topped pool C with a 4-0 record; unfortunately that came at the expense of in region rivals Swarthmore (10-6) and #23 Allegheny (13-6); #15 Lehigh Gravity and Oberlin Preying Manti also won their pools, however these sets of wins were against low level D-III teams like SUNY-Cortland or underpowered D-I teams. If teams are able to attend the rescheduled bracket play, it will be informative to see how those teams look a few weeks from now. So far this season, the Northwest teams have been getting a lot of touches on discs in sanctioned games; this weekend was no different. #18 Pacific Lutheran Reign had a successful time at their home tournament, PLU BBQ, ending third with a win over #25 Portland UPRoar. #22 Lewis and Clark Artemis started the weekend strong with a 4-0 win, putting them at the top of their pool and a complete 180 of their 0-3 weekend at Stanford Open; they finished the weekend fifth after a loss in quarters. D-III teams had a tough time at Commonwealth Cup against their D-I opponents; #20 Catholic Nun Betta, Richmond Red Hots, Davidson DUFF and Elon Wild Rumpus all either won one or zero Saturday games. That set up a D-III heavy bracket for 25th place, with Catholic and Richmond each notching wins over Elon, 11-9 and 12-5, respectively. Both Richmond and Catholic are keeping themselves in the discussion for who takes the autobid to Nationals in May–with Elon and Davidson in danger of falling out of the conversation, unless they can earn some meaningful wins in the next few weeks. There weren’t any major tournaments to discuss in the D-I men’s division, although D-III had plenty to talk about this weekend, so read on for our D-III section! NC State won the first game in the Atlantic Coast Showcase, beating Duke 15-8. David Jones was unstoppable for the host team: you can read more here. No. 1 seed Texas State moved to 16-0 on the year by winning Dust Bowl, their second tournament victory of the season. Watch for Jake Reinhardt, a U20 selectee, who has pushed them to be a team to watch later this season. It was an all D-III final at Oak Creek Challenge, after no. 1 seed Temple was knocked out by RIT in quarterfinals. Mary Washington took home the trophy over Amherst. For more, check out our D-III update below. Claremont went 5-0 in one day play at SoCal Mixer, getting the best of 2nd place finisher and Southwest D-III rival Occidental 11-9. Add Music City Tune-Up and Bring the Huckus to the rainout list, as both had Sunday play canceled. At Music City, no top four seed won their pool, as no. 8 seed Mississippi State, no. 10 Xavier, no. 11 Samford, and no. 5 Alabama all came out on top of the pools. Bring the Huckus’s list of undefeated tier I pool-winners: No. 1 seed Middlebury, no. 2 Princeton, no. 14 Boston University, and no. 4 New Hampshire. Delaware-B won the development tournament Solar Showdown, defeating Virginia-B 15-6 in the final. They entered as no. 1 seed and ruled the roost of Metro East, Atlantic Coast, and Ohio Valley development squads. It was a crazy weekend in the D-III Men’s division. With nine teams from our Top 25 in action across five different tournament in three different time zones, there was an incredible amount of action to keep up with. Unfortunately, storms on the east coast saw several tournaments cut short with Sunday play canceled. #2 Middlebury Pranksters got their spring season off to a strong start with a 4-0 pool play performance at Bring the Huckus. #14 Army West Point wasn’t quite as convincing, going 3-1 with all four games decided by one point. Music City Tune-Up in Nashville also had Sunday play canceled, leaving us with a lot of unanswered questions. The surprise of the tournament was Samford Dogma, who won their pool with a pair of 9-8 victories over #21 Union Jaxx and UNC Asheville Bulldogs. Union was particularly disappointing, finishing 2-2 and getting blown out by UNCA. The Bulldogs had an impressive day outside of the loss to Samford, though, with their three wins coming by a total of 23 points, but the loss to Samford leaves us wondering which results to weigh more heavily. Outside of that pool, Xavier B.L.O.B. went 3-1 to win their pool, setting up what would have been an intriguing matchup with UNCA. Alas. Oak Creek Challenge saw four teams in action, with #8 Mary Washington Mother of George coming out on top, going 6-0 and winning the whole tournament. Their two most impressive wins came over #7 Amherst Army of Darkness, who went 4-2 with their only losses coming to Mary Washington. MoG looked shaky to start each day of the tournament, squeaking out double game point wins over Ohio and Pennsylvania on Saturday and Sunday, respectively. They got into a rhythm after those games, with their other four wins coming by a total of 22 points. MoG made a statement this weekend, not just as the top team in the Atlantic Coast, but also as a top five team in the entire division. The New England region will rue Oak Creek Challenge as a missed opportunity for them to make a move in the competitive picture for strength bids. Amherst’s weekend was strong, but the losses to Mary Washington were both by five points, surely a much larger margin than Amherst would have liked. #19 Williams WUFO had a fine weekend, going 3-4 and getting put out of the bracket by Amherst. However, they only beat the teams they were supposed to beat and failed to pull off even a single upset to push them up the rankings. #24 Brandeis Tron will be disappointed with their spring season debut. Their 4-3 record looks good on the surface, but their three losses were by a combined 14 points; those big losses won’t look great in the eyes of the rankings algorithm. Lastly, #13 John Brown Ironfist and #23 Claremont Braineaters each had strong weekends at Dust Bowl and SoCal Mixer, respectively. Ironfist fought through the strong winds of Tulsa, OK, to finish 5-3, picking up solid wins over Texas Tech and Rice. John Brown was playing without some of their better players, including Grant Bruner, so we’ll wait to see how they look with a full squad at later tournaments. The Braineaters swept the field in their home tournament. The field was primarily composed of B-teams from local D-I schools, but Claremont did pick up a big 11-9 win over Occidental, confirming their status as frontrunners for the Southwest’s bid to Nationals. The beginning of March marks the season hitting a new gear. Stanford Invite is one of the season’s key events, but this weekend, there’s wall-to-wall ultimate. Stanford Invite (M/W) is here to push forward the national conversation…if the rain lets it. You can watch games live on Ultiworld! In the Women’s Division, 13 of the 16 attending teams are ranked. Will another California tournament be marked by a clash between #2 Stanford and #5 UC San Diego? Will #4 Colorado get to another final? How will #3 British Columbia look in their first tournament? What will #7 Carleton and #11 Pittsburgh do against west coast powers? In the Men’s Division, it’s impossible to ignore the prospects of getting #1 Carleton and #2 North Carolina on a field together. But #4 Oregon, scorching-hot #6 Brown, and a rising #9 Cal Poly SLO are on the list of contenders that want their claim to the crown. Midwest Throwdown (M/W) features a cast of North Central, Ohio Valley, Great Lakes, and South Central teams looking to make a name for themselves, and perhaps become threats in their respective regions. Atlantic Coast Showcase (M/W) welcomes a more formidable guest this week: UNC Wilmington. Comments on "College Update: Commonwealth Cup, Big D-III Weekend"